As can be seen by my last post on Fuller's Vintage Ale 2000, ageing a beer can provide wonderful results. But it's important to remember that ageing, cellaring, or whatever you want to call the prolonged storage of a beer before drinking it, is to a certain extent something of a gamble. There are so many factors which affect how a beer will turn out that there is always going to be an element of risk involved. That said there are a few key things you should think about when selecting and storing a beer for an extended amount of time. Stronger, higher abv beers will always age better than lighter, lower abv beers as the alcohol protects and preserves the liquid over its long maturation, creating pleasing complexity yet keeping out the nasties which can cause unwanted staleness or sourness. Hop flavour and aroma will diminish massively over time so select beers with plenty of malt character to develop and mature over time. Anything pale and hoppy is best drunk fresh, although some imperial IPA's such as Dogfish Head's 90 minute IPA have enough backbone to be worth a go. 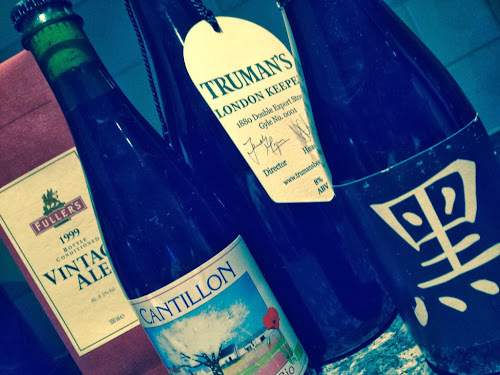 There are a number of classic British styles which are suitable for ageing, such as Imperial Stouts, Barley Wines and Old Ales, but Belgian ales such as dubbels, tripels and even some lambics or wild ales will also mature beautifully. Its also worth noting that lambics are the one exception to the high abv rule, typically being in the 4-6% region they will often age very well as the wild yeasts round off the sharp edges of the beer. Some belgian beers, such as the Belgian Orval, contain brettanomyces (aka Brett), which is a strain of yeast which will dramatically change the flavour of a beer during ageing. Often associated with a 'barnyard' or 'horseblanket' character it is a flavour which people will either love or hate - or as in my case, learn to love over time. Though associated with them now, brett isn't unique to Belgian beers and was actually first isolated from British stock ales and porters - hence the name, which is Greek for 'British Fungus'. Unlike wines, beers should always be cellared upright, even if they have a cork closure. This is something of a point of contention but taking into account the positive and negatives on both sides, i.e. cork drying out vs contact with it affecting the flavour of the beer, I think it is much safer to store the beer upright. It also has the added benefit of meaning the yeast and sediment will settle and often stick as a ring at the bottom of the bottle, meaning you can pour the beer into glasses without chucking loads of gunk in. Finally, and this is really important, keep your beer in the dark. Light is not your friend when it comes to ageing beer so whilst a shelf in the cupboard is fine, a shelf near a window is not! It’s also important to keep your beer at a stable, cool temperature, around 10*C is best. But you don’t necessarily need a cellar to do this, a cool cupboard under the stairs, a pantry or even a cupboard in your spare room (radiator off whenever possible) will do just fine. Temperature is the hardest one to control but as long as you avoid wild fluctuations and keep the beer somewhere relatively cool, you'll generally be fine. I'd love to hear your successes and failures in ageing beer, so feel free to comment below.